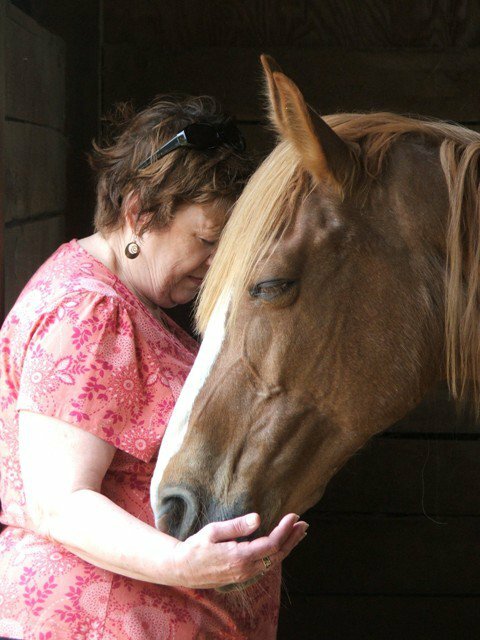 When Traveller’s Rest Equine Elders Sanctuary was founded, the goal was to provide sanctuary; a place of safety; a stress-free home where everything fits together as a smooth, harmonious whole. We tried to take into account everything that might affect the well-being of both horses and sanctuary, physically, emotionally and spiritually. Somewhere along the road our program took a slight detour, veering into a commonly seen model in which as many horses as possible are taken into a facility, filling every available pen, paddock, and stall. Housing too many horses at the sanctuary drove the stress-free and harmonious factors in the equation into the background. While TREES’ residents have never lacked food, shelter, veterinary, farrier or dental care, just meeting “the basics” is not enough to make our Sanctuary whole. With that in mind, Traveller’s Rest is undergoing a metamorphosis; not so much a change in purpose as a rebirth – a return to our roots. We are making some changes in order to return to a more holistic path toward sanctuary; a path we hope will lead beyond “good enough” and set a standard of excellence. First and foremost, that means moving away from the idea of accepting another horse any time there appears to be physical space for one more. “Space for one more” means far more than having a spare stall or a vacant paddock. We want our horses to live peacefully in harmony with their environment. Operating a farm under crowded conditions automatically creates conflict with that environment. Pastures become unhealthy, parasite and pest control becomes very difficult if not impossible, and the horses themselves become stressed, anxious, and irritable, all leading to a decrease in the horses’ physical well-being as well as damaging the land the horses call home. TREES hopes to develop Sanctuary as an all-encompassing concept rather than being seen merely as a horse farm that happens to house elder equine. From this point forward, TREES will set a maximum herd size of 12-15 horses rather than the average of 18-20 we tried to maintain for the past several years. Not only will a smaller herd lead to a more balanced sanctuary environment, but it will also allow time for more educational efforts, something that suffered greatly in the last few years. Education will, of course, remain focused on equine elder care, but we will also begin to incorporate more “green” horsekeeping philosophy. Our standards will include integrative management techniques in which the sanctuary environment is every bit as important as the horses in it. Practically speaking, there is no way to separate the two facets of the sanctuary – what we do with the horses affects the farm environment and what we do with the farm environment affects the horses. The Sanctuary is a microcosm of the interconnected nature of all things; what affects one thing affects all things. So, as TREES enters its second decade, we continue to grow by becoming smaller in one sense, while hopefully achieving more balance over all. It’s exciting to imagine what that balance may bring.